Full localization of your digital publications is allowed: everything can be translated into the language of your choice. You can edit the resource strings and dialog boxes, or add new strings according to your needs. 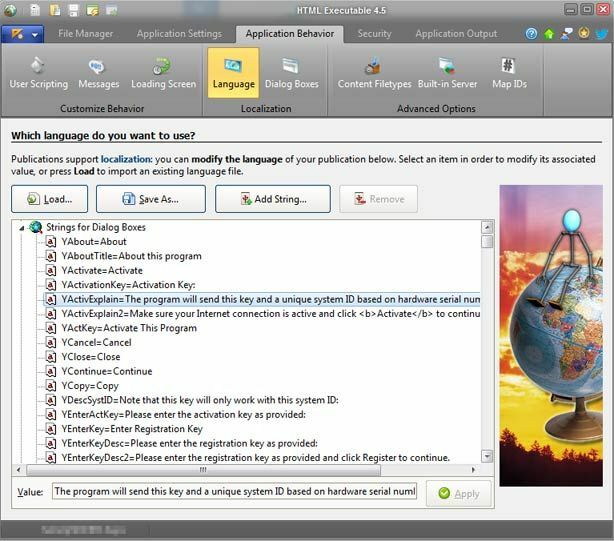 Moreover, you may import/export language files for later use. Editing strings does not require an external tool: use the built-in editor of HTML Executable. Change the page templates used to create all dialog boxes of the ebook. Modify the About box of your publications and ebooks. You can also remove the "Built with HTML Executable" mark from the about box if you have purchased the "No Branding" option. Other HTML compilers always put their name somewhere in your ebooks. In HTML Executable, you can completely remove the visual trace of HTML Executable!